Two members of the Earth Focus Foundation team went up to Luxembourg from the 17th to the 19th of March 2016 to attend the 11th annual European Global Issues Network conference. The Global Issues Network is a conference between international school students. Hundreds of students meet over a few days to discuss current social issues and create and learn about fellow student projects surrounding these topics. They learn about ways to act in their schools and in everyday life to improve society as a whole. They return to the conference the year after with their success stories, inspire other students to act as well, and so the cycle continues. Earth Focus Foundation was invited to this year’s conference to do a workshop on the theme “Caring for Humanity, our Duty”. As the Sustainabus wishes to appeal to people of all ages, this was the perfect occasion to try out a game that we are developing that will discuss the collective impact of our individual actions. We want to inform people of all ages about sustainable values in a fun way, which is why we started developing this board game. When we go to different schools around Geneva we will bring the board game with us, along with other games and activities that we will develop, and teach students using interactive games and activities. The idea is simple enough. You move the Sustainabus through the board, stopping at different areas throughout town. At each stop you can decide whether to discuss environmental, social, or economic issues. You can also decide whether you want to have an event on education and information only, or maybe an event focusing on discussing actions and projects that one can create. For example, if you pick up an environmental card, it could suggest the topic of Agriculture. With the help of the game monitor, discuss in your team the problems surrounding industrial agriculture and complete a Sustainabus event that talks about ways to combat this issue at our local level (Come to one of our events to find out how!). 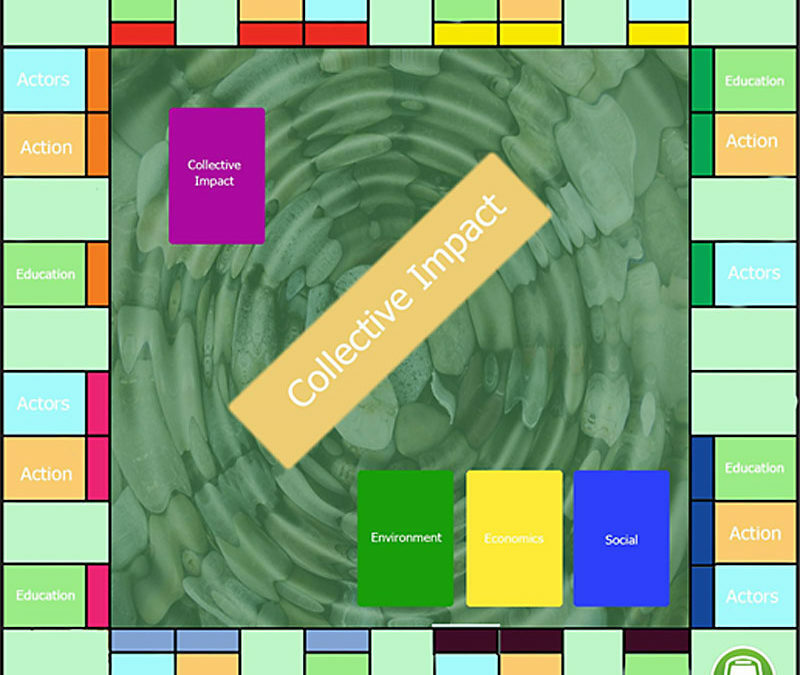 After you have completed three Sustainabus events you will receive a Collective impact card. The team with the most Collective Impact cards wins. A Collective Impact happens when the sum of all individual actions create something bigger than each individual part. For example, if you, your friends, and your friend’s friends start taking their bikes instead of their cars to work, the collective impact of this action will be city investment in bike lanes and better overall health. In the end, the collective impact game wishes to show people that individual action do make a difference. We are all responsible for our society, and if you add up every individual action that each person takes, we realize that we can indeed make a big difference in our communities. The conference was a great success, and we received plenty of positive feedback for our game. We will develop our board game further, and we hope to see more conferences on Action for Sustainability in the future! Our Sustainabus team was created through Earth Focus Foundation, a Geneva-based organisation that wishes to educate people of all ages on themes surrounding sustainability.